CAN$95 for students!Write us at sales@terminotix.com to know how to buy SynchroTerm for students. SynchroTerm accelerates the process of extracting terminology and creating term records by employing statistical algorithms to automatically identify equivalent terms. It automatically extracts source terms, their equivalents and their contexts from file pairs in any format, LogiTerm bitexts, SDLXLIFF, XLIFF or TMX files. A number of extraction and record creation settings are available to optimize results: minimum number of words per term, maximum number of words per term, number of occurrences, substantive-only extraction option, LogiTerm term base cross-referencing function and much more. 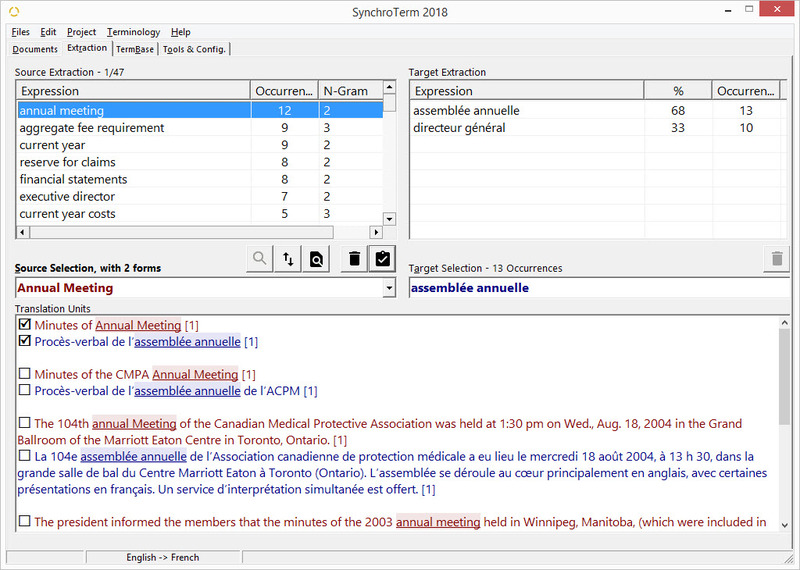 SynchroTerm is compatible with 30 languages: English, French, Spanish, Italian, Portuguese, Polish, Haitian Creole, Slovak, Czech, German, Swedish, Russian, Greek, Dutch, Hungarian, Norwegian, Turkish, Danish, Bulgarian, Finnish, Romanian, Lithuanian, Slovene, Arabic, Chinese, Latvian, Croatian, Estonian, Gaelic and Maltese. Export your records in one of eight available formats, then import them into your chosen terminology software tool. When creating records, you can automatically pre-fill up to 11 fields with predefined values, rather than re-entering the same information in each record. 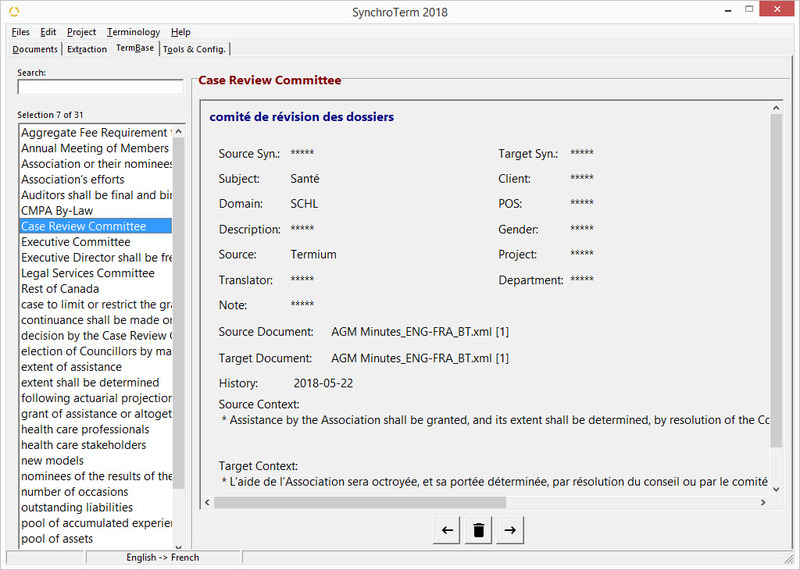 The software’s Restrictive Terminology option allows you to upload a list of source terms so that SynchroTerm extracts only these terms from your document corpus.